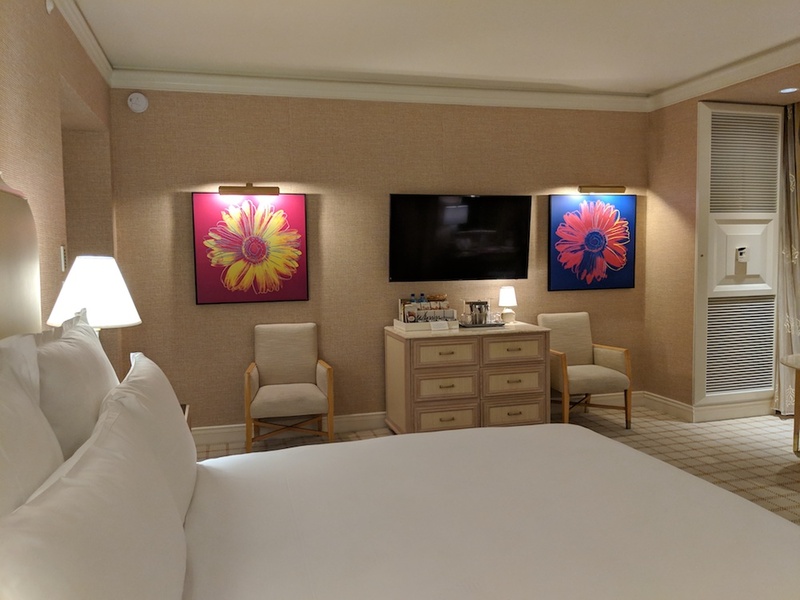 We spent four nights at Wynn Las Vegas Hotel and Resort this past December (early in the month – a sort of pre-Christmas Christmas vacation). Located on the north side of the strip, pretty much at the edge of things, you’ll find a bit more ‘calm and space’ at this luxury hotel property. Bordered by man-made lakes, water features, and lush greenery, it’s a lovely space and more serene than many of the other Vegas properties. All this is not to say that you’re out of the action – you’re right beside the Palazzo and Venetian complex and their restaurants, shows, and myriad attractions and right across from the sprawling Fashion Show Mall for all your high and low end shopping needs. But you can find a bit of peace when you need it, both inside and out. It was one of the reasons we chose to stay here in the first place. 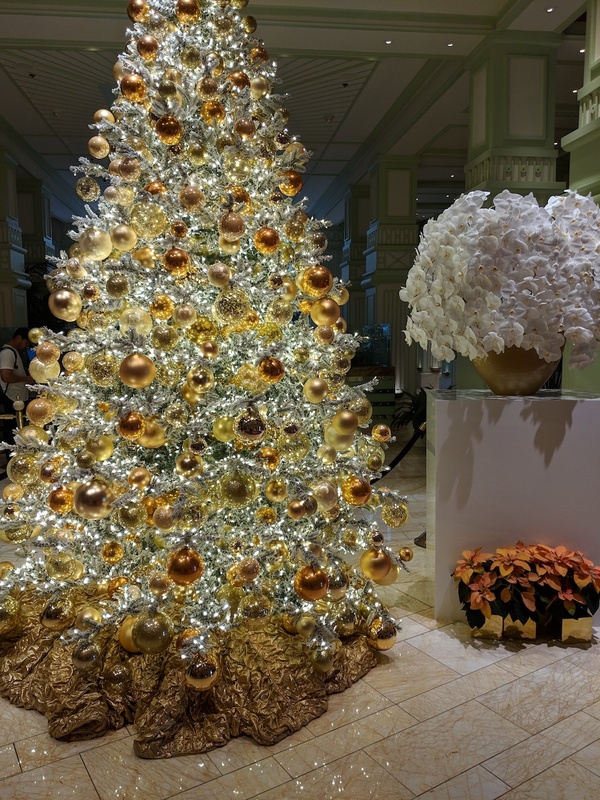 We arrived early on a Sunday evening, greeted by gorgeous Christmas decorations in the hotel lobby – indoor landscaping, really. 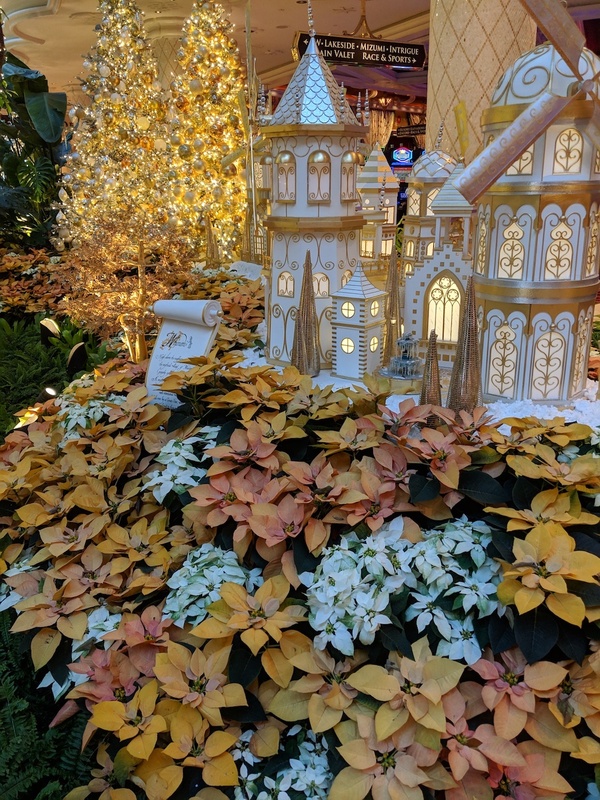 Luscious Golden Poinsettias, grown exclusively for the Wynn Hotel, were everywhere. 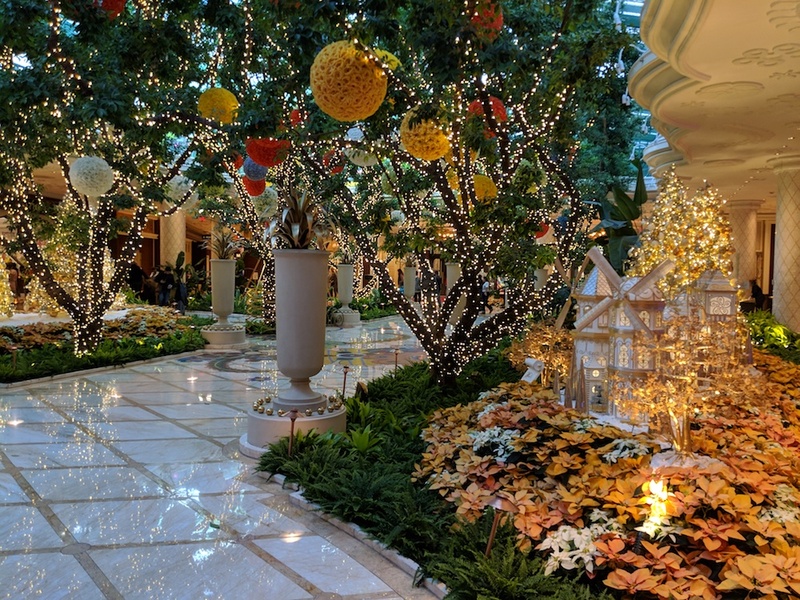 In our opinion, it is by far the prettiest lobby on the strip, with lots of natural light, greenery, and this past December, a magical holiday feel – not something you’d necessarily expect from a casino. The casino itself is also very inviting, not so cavernous as compared to those at the other hotels. Rich red carpets with bright, bold designs, highly polished marble floors, and lots of warm overhead lighting enhance the casino experience – or even just your walk to restaurants and other activities. 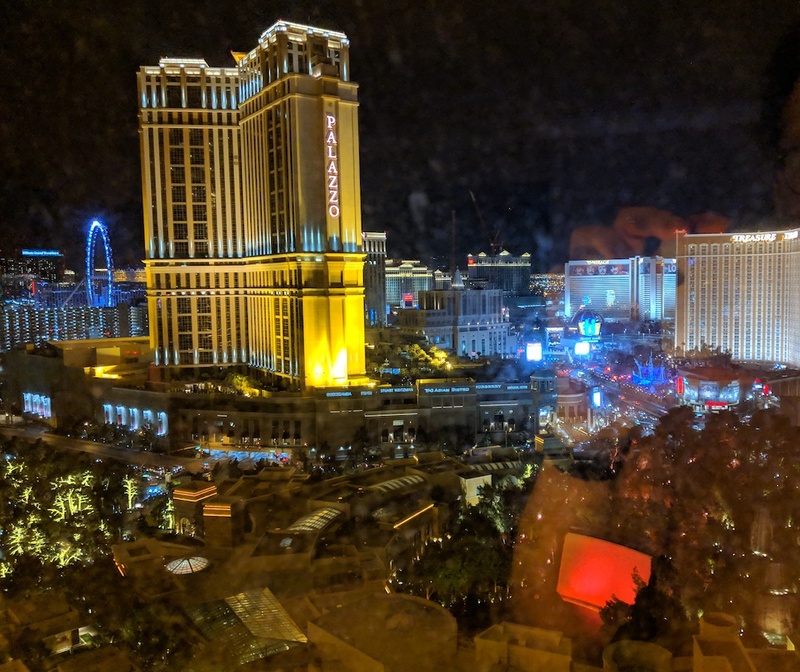 Upon arrival, we were upgraded from our basic king room to a higher floor (24th) and a corner location with two floor-to-ceiling window views of the strip. We’d stayed here before, and this earlier time in December was clearly a slow time in Vegas – certainly worked out for us! As you can see, the room itself was very spacious – lots of breathing room. Minimal but very tasteful decor, and everything seemed fresh and new and in tip top shape. 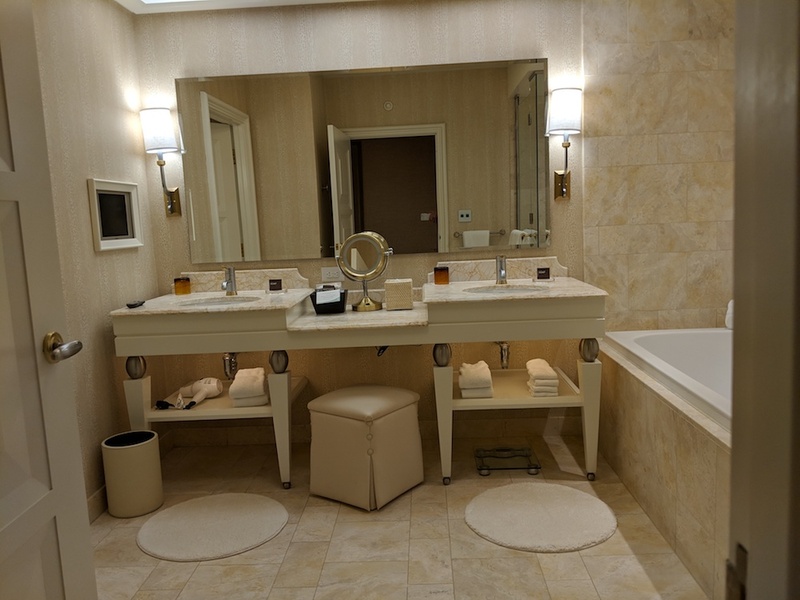 We had a huge luxury bathroom complete with gorgeous marble tile, his-and-her sinks, water closet, a massive soaker tub, and separate glass-enclosed shower. Plenty of room to spread out and relax. 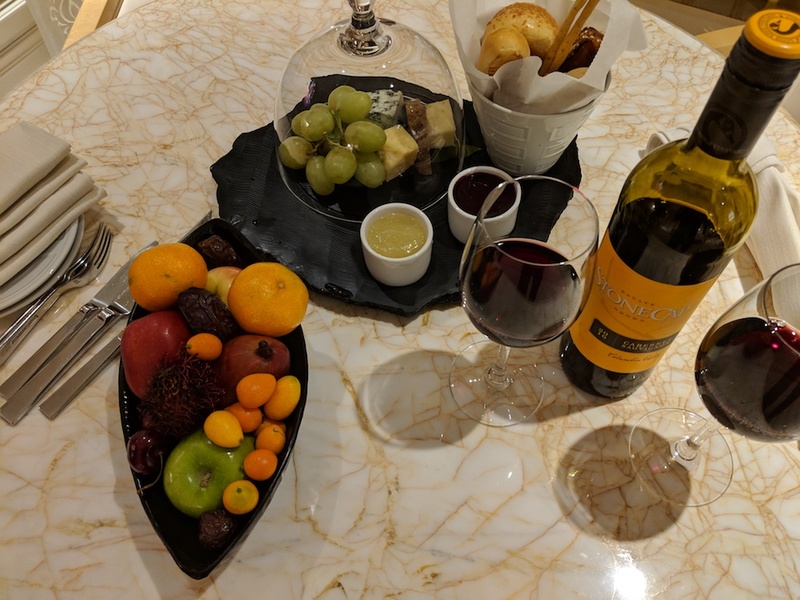 We pre-arranged to have a fruit and cheese plate and bottle of wine delivered upon arrival, one of several optional add-ons when booking the room. A very nice touch – recommended! 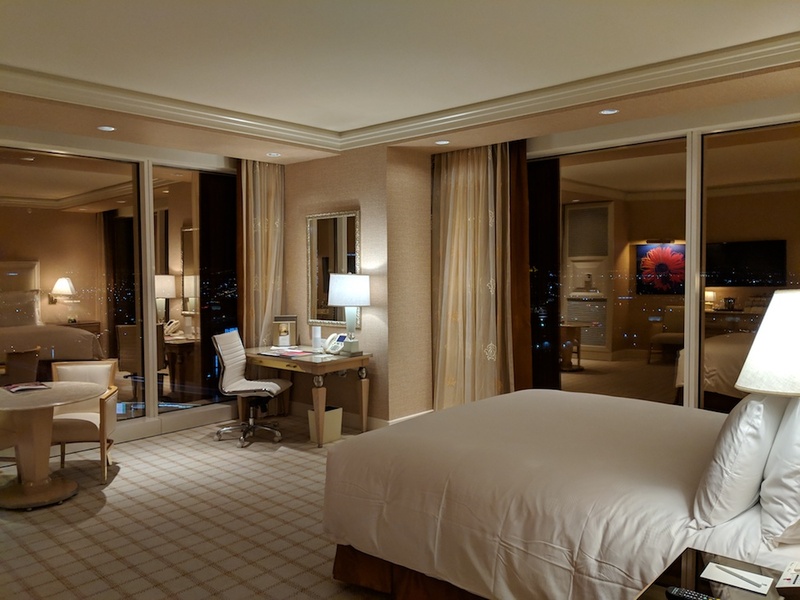 Our room was fantastic, and Wynn has so much to do within its own massive walls there’s little need to venture elsewhere. In fact, if we’d been staying elsewhere, we would have surely ended up at the Wynn anyway many times for dinners, lunches, and shopping. Fine dining highlights include Lakeside Seafood, with views of the Lake of Dreams and its wonderfully quirky light shows, and the positively phenomenal Costa di Mare, an award-winning Italian and Mediterranean restaurant featuring mind-blowing tasting menus and impeccable service. A new shopping wing is also opening up in stages, featuring high end shops and designers we haven’t yet seen elsewhere on the strip. When it’s in full swing, it will be certainly be a a luxury shopping destination. And of course, there’s Le Reve, the Wynn’s stunning fantasy show featuring breathtaking acrobatics on dry land and water. 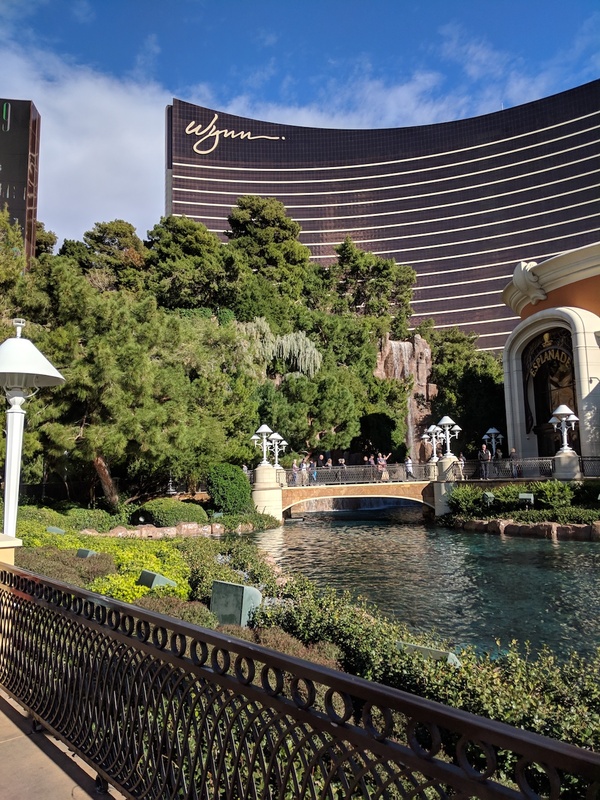 For a relaxing, luxurious Las Vegas trip still minutes from all the action, we definitely recommend choosing Wynn Las Vegas. The MGM Grand has the distinction of being the most sprawling of the hotels that have transformed the infamous Las Vegas “strip” in recent years. 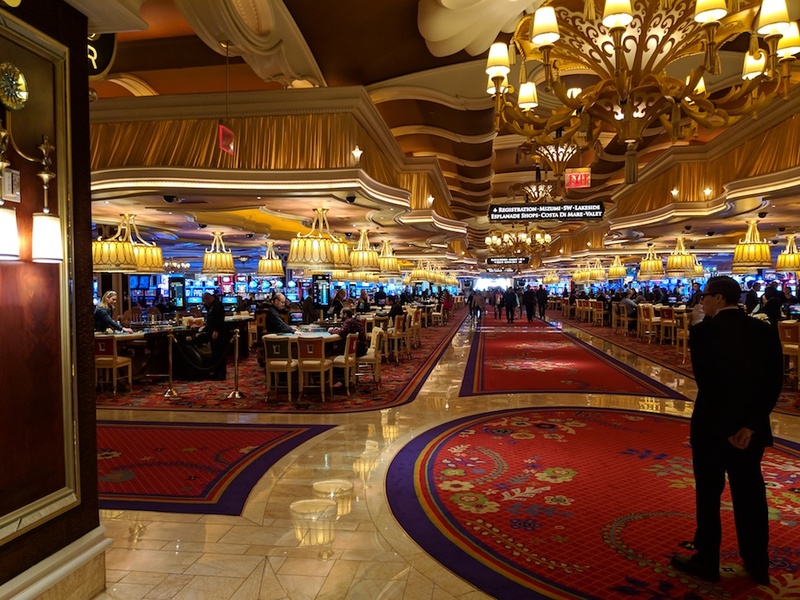 What doesn’t it have – there are luxurious rooms, food court style eateries and fine restaurants, shopping, live lions, a custom built Cirque de Soleil amphitheatre, and of course, a massive maze of a casino. Somehow, amidst all this stimulation and grandeur, the exclusive “Sky Lofts”–an impressive private wing of the hotel–provides quiet and rest. The service at Skylofts was absolutely exquisite, beginning with our pick up at the airport for a chauffeured ride to the hotel. We were greeted by an extremely personable concierge who like a genuine, old friend knew just what to say and what not to say. 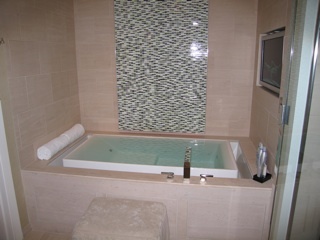 He led us to a private elevator and escorted us to our suite, offering a tour of its luxurious amenities. The stark, ultra modern design of the suite is impressive, to say the least. 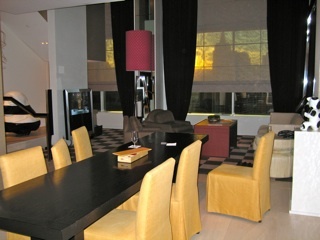 There are two floors dominated by a floor-to-ceiling window with an incredible view of the strip. Though the room is hardly cozy, its minimalist décor and uncluttered openness is definitely comfortable–it’s a place that didn’t attempt to be “home”, and for a brief vacation, this was perfect. This is pure fantasy, the ultimate jet-setting side of Vegas. Lights, draperies, televisions, sound system–virtually everything is controlled by a state-of-the-art remote control system. The bathroom is a particularly decadent space. 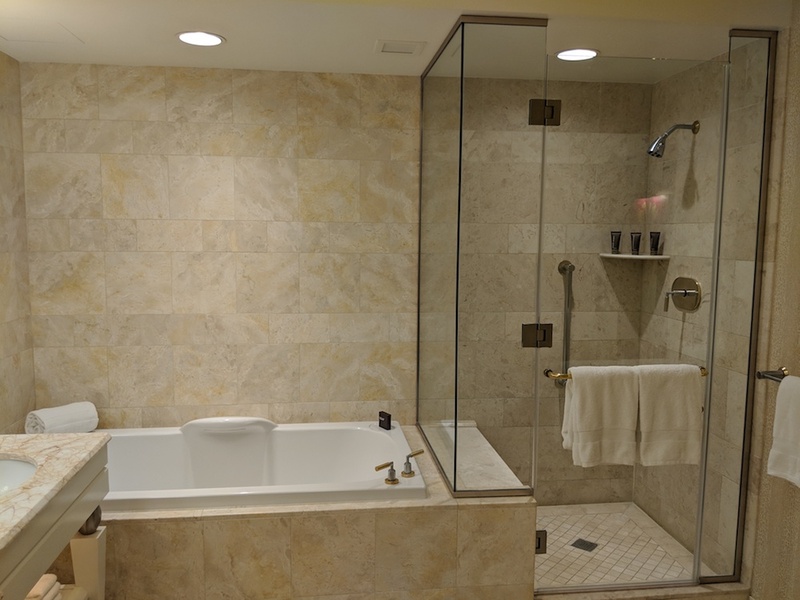 The massive glassed-in steam shower and deep jet-tub promise more aquatic refreshment than should be possible in the heart of the desert. A sound system pipes music throughout the suite with several pre-programmed collections of relaxing new age and world beat tunes. Naturally, there is the expected suite service of the highest caliber. An attendant carefully unpacked all of our belongings upon our arrival and took a few moments to point out several amenities we may have missed, such as how to operate the espresso/cappuccino maker. 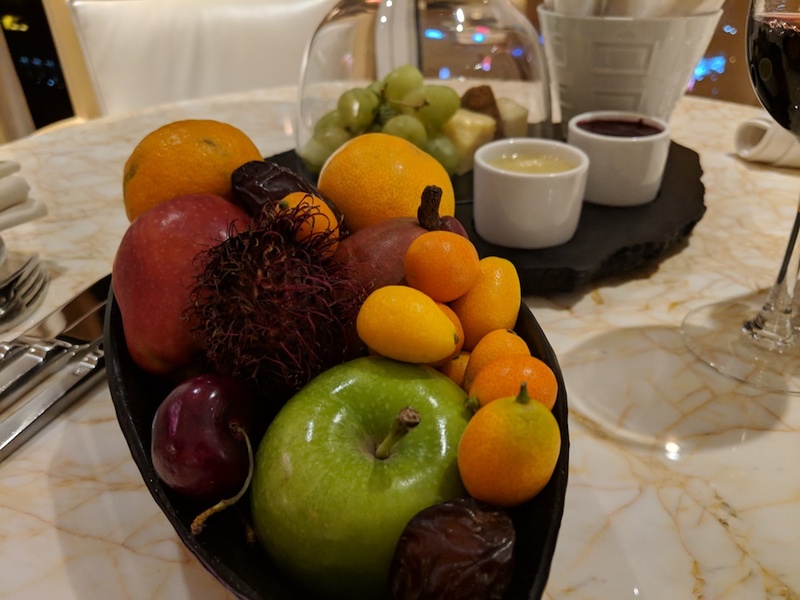 The room was kept impeccably clean throughout our stay, and small touches like the perpetually refreshed dish of berries on the dining room table made us feel truly welcomed. Outside of the room is an entire world of rest and play. We could easily have spent our whole vacation in this single hotel. There is the casino of course, who’s blinking lights and groovy noises are strangely captivating, even to the non-gambler. Casual dining, like the Rainforest Café, is fun for families and those who enjoy heaping plates of food while sitting under a jungle canopy with simulated monsoons and animatronic animal antics–you know the type. Then, by way of utter contrast, for the ultimate in gastronomy and sophistication, there is Joel Robuchon Restaurant, named for the world famous French chef at its helm, offering a menu of culinary art and astronomical prices. Take in a show–whether it’s Barry Manilow, the comedian du jour, or Ka–Cirque du Soleil’s spectacular show with all the thrilling and physics-defying acrobatics Cirque is famous for. MGM Sky Lofts is all you could hope for in Vegas–luxurious, spacious, filled with amenities, away from the din but close enough to it when you actually want to embrace that signature Vegas insanity. We give the Skylofts at MGM Grand 5 Stars- Outstanding! The Skylofts at MGM Grand are located at 3799 Las Vegas Blvd South, Las Vegas, NV 89109. For hotel reservations call 1877-646-5638 or contact [email protected] Visit www.mgmgrand.com for more information.